I love these noodles! You can kind of tell from the photo they are long and flat, with a nice doughiness about them. I believe in Chinese they're known as dao xiao mian, but there are multitudes of Chinese noodles! Anyhow, about a week after 4th of July, I heard that a Chen's had opened in Oak Hill. WHAT??! A friend went for lunch and texted me a pic of the menu -- more options than the original location! Subsequently I heard from three people that the food was quite fine, including Mary Makes Dinner, who got take out from Chen's. She lived in China for several months, so she knows her noodles and dumplings! Finally an opportunity came to check out this new Chen's for myself and with two other well-educated food lovers! 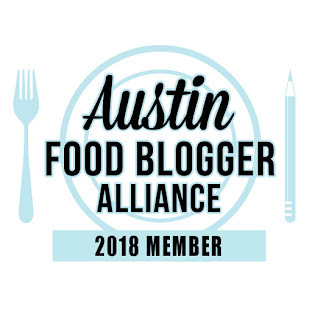 The restaurant is located in the strip center at William Cannon and Hwy 290, the former T + N Vietnamese, in the same shopping center where Flores Mexican is (which will move out soon for a new spot on William Cannon, and Via 313 Pizza will move in -- yay!). Construction abounds, however. 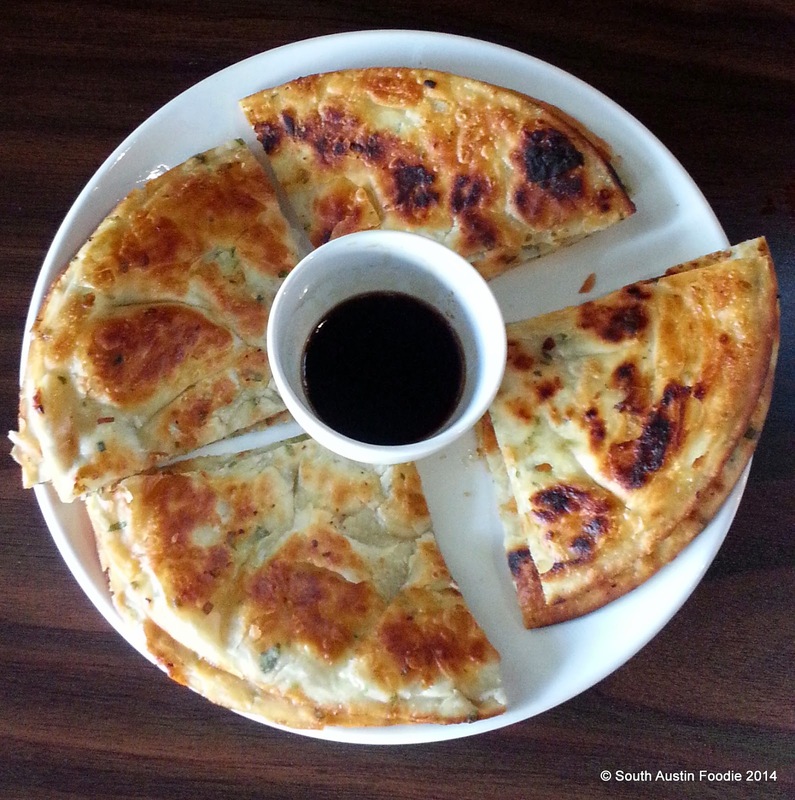 I've always thought Chen's made amazing green onion pancakes, and the new Chen's still delivers! Light and crisp, flaky and a touch chewy in the center with a very mild green onion taste....I could eat these for days. 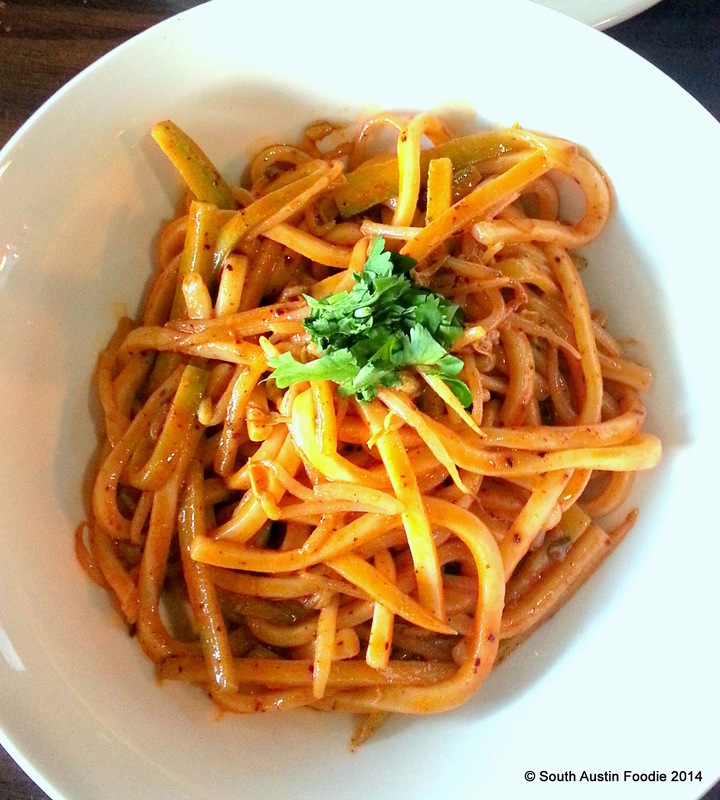 The first item on the menu board was spicy cold noodles which intrigued us. These fat noodles with cucumber had a lovely flavor of sesame (kind of like tahini) and a distinctive mustard taste. There was also a bit of chile heat to the dish, which I think is vegetarian (no pieces of meat, let's put it that way). And for $6, a steal. 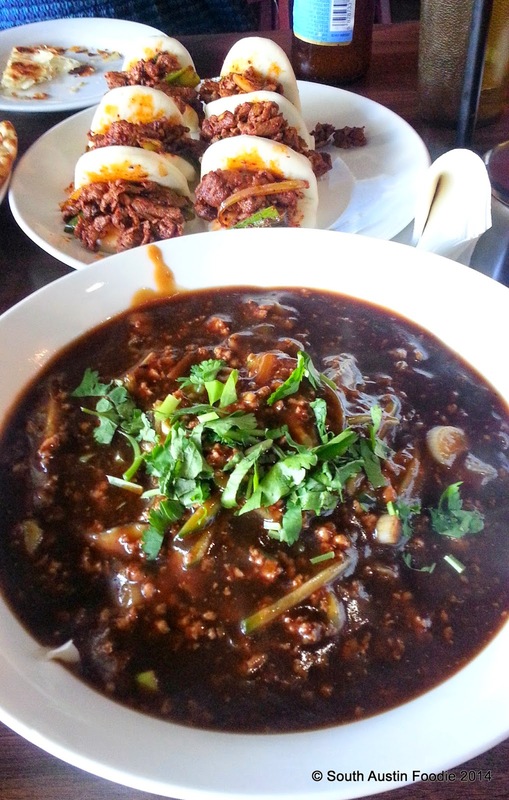 We got the spicy lamb buns and the black bean noodles. When I've had the lamb skewers (which they do have on the menu at the new location) at the original location, they've been nice chunks of meat with a decided szechuan peppercorn flavor (it's hard to miss the tingling sensation in the mouth that one often experiences with szechuan peppercorns). These had a cumin taste rather than the peppercorns (which are actually related to the citrus family, not an actual peppercorn! ), and the meat was in smaller, more shredded pieces. Still good though! If you are vegetarian, don't let the name "black bean noodles" fool you, as there is pork in the dish. It normally comes with a different noodle (possibly the ones from the spicy cold noodle dish? 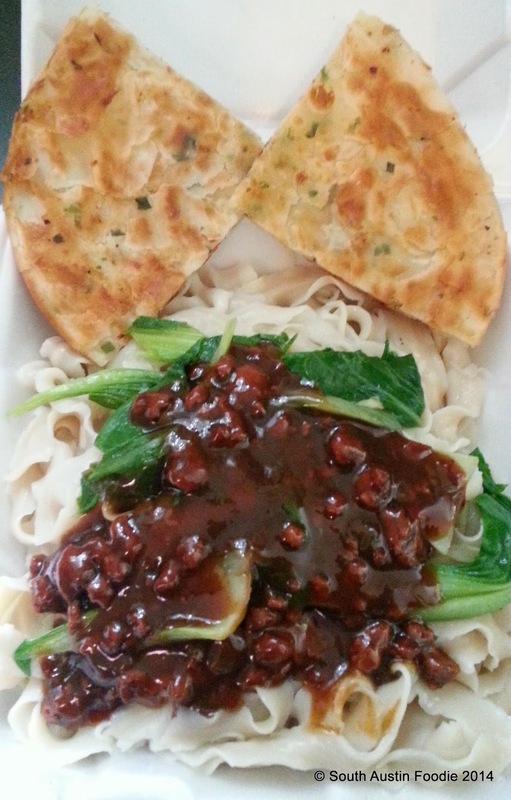 ), but we asked for them with the knife cut noodles, and they had no problem making the substitution. I love the savoriness of the sauce, with the ground pork and fermented black beans. (See why I posted the other picture of the knife cut noodles? You can't actually see the noodles in this one!) I really should try some of their other noodle dishes on my future visits, but I am kinda addicted to these. 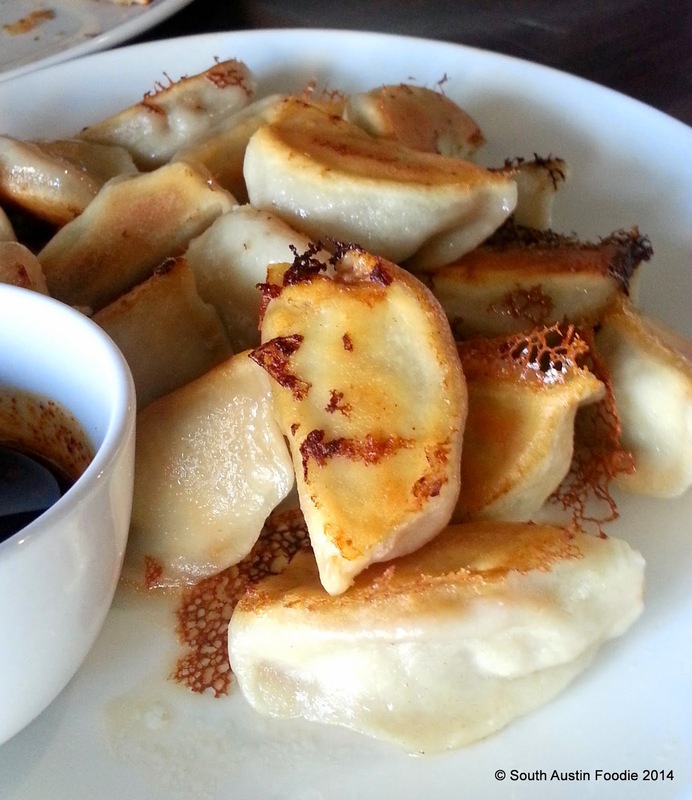 And the pan-fried dumplings, which I always prefer over steamed because I like how they get crispy on one side. This was a huge plate of them, though they're not very big. But the dough consistency was perfect, and really tasty with the dipping sauce. The chile paste/condiment on the table had sesame seeds in it too, and a little of that added to the dipping sauce (soy-based) kicked it up nicely. You can BYOB; we asked when we entered, and they said it was okay. You order at the counter, and the woman who took our order was very nice, as was the runner who brought out the dishes. Don't expect much from the decor at Chen Z's; I think it's entirely left over from the previous occupant. They could certainly stand to put some pictures on the walls or something. But it's the food that counts, and it's a winner, as are the prices. The three of us ate for a total of $39, and had some leftovers. Now since I was there, I've had one friend mention to me that she had a reaction to the MSG in the noodle soup, but I know she has a bit of a delicate system. I don't have reactions to it, but if it's not your thing, you may want to ask before ordering. 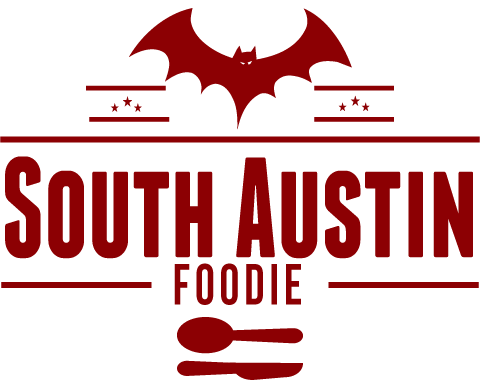 I can't wait to go back and try other things on the menu! Those dumplings haunt my dreams! I have given up gluten for a little while(to do with nursing) but as soon as I'm back on wheat I'm heading back to Chen Z.
I haven't been in well over 9 months, if not longer, though I have been craving it lately. My experience has always been decent with them, but I know that English is not their first language.